"Heather, one day, you are going to have kids, and they are going to find a bug and want to put it in a jar and you are going to need to help them. They are going to want to play in the dirt and you will need to let them. Just because you don't like dirt, you still have to let your kids play in it, it is part of being a kid." You see, I don't like dirt. I don't like it at all, I never have. In fact, I would rather clean toilets than pull weeds. (Our toilets of course, not someone else's). One reason I don't like dirt is because there are bugs in dirt. And worms and spiders and other living things you can't see. My brothers both know this about me. They know I don't like dirt, or bugs. Every summer, when the kids get out of school, this story comes back to my mind. The kids are going to be outside more. They are going to want to explore and discover, and they are going to want me to "play" with them, and show me what they discover. They are going to want me to hold worms and use mason jars to make homes for lady bugs and butterflies. Every summer I remember what my brother told me that day. I put on my game face and start pretending, the best I can. Our kids have no idea I don't like dirt. You see, our children's understandings and likes and dislikes are influenced by us. If we say we don't like something, or it is bad, that is how they will probably feel also. Limiting them, to only the things we like, can stifle their growth and development. We have to be open minded and not let our preferences limit our children. We have to let them explore and adventure and discover. It is normal and okay for our kids to like things we don't. That is the beauty of each of us as individuals. Life would be boring any other way. So what can we do when our kids like something we don't? 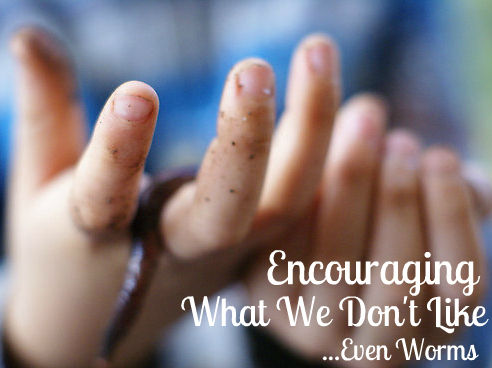 What do we do when our kids like worms and we can't stand them? I might not want to go outside and dig in the dirt, but I am happy to provide our kids with lots of supplies to explore the dirt and bugs. Shovels, rakes, and buckets etc... And when they holler that they need a mason jar to put their latest find, I am happy to provide that supply also. I even poke holes in the top for them. (I just try not to touch the bug). Our son loves to collect rocks. So last week I saved an egg carton for him to use to "classify" his collection. Rocks are dirt to me, he thought it was the greatest thing ever. The smallest of supplies will make a huge difference. Provide a location for them to cultivate their "likes". This might mean a place to keep their mason jars with bugs, or their rocks. A special place to keep their supplies so they can get them out when they want. We have a rule that you can't bring bugs, dirt, sticks, or rocks in the house. So they have a special place in the garage to keep those things they want to collect. Our son complained that he needed his rocks in his room. So we compromised and as long as he washes his rocks first, then he can keep them in his room in his "special drawer". It might sound silly, but it works great for all of us. Provide resources. Take a trip to the library and check out books about what they like. Find websites and even classes in the community that help them learn more about their "likes". We don't have to like the same things, but just listening to their excitement and discoveries will make them feel supported. Listen to their adventures and ask them questions. The questions will help their excitement grow and will cultivate a relationship between the two of you. Consider it bonding. (Remember the power of listening first. It will improve behavior also!) If you can't listen because you have heard about it a lot, or maybe you get the heeby-geebies, find someone who can listen. When our kids want to talk bugs, I have them call my mom. She is really good about bugs. "You know who would love to hear about your bug, grandma, let's call her"
Our son loves space. (He DVR's Nova.) I don't care for space so much. I am amazed by it's creation, but I don't have a need to understand it, or solve it's mysteries. I love to listen to our son talk about it a lot, but when I sense that I don't know enough, I send him to talk to my husband. My husband loves "talking space". Take a few minutes and learn about what your children like. Do some of your own research so you have more to talk about with them. The funny thing, when we start to learn about what they like, we start to like it a little more too. I have found this with dirt and bugs and space. (And even motorcycles with my husband). They aren't nearly as bad as I think, when I start to learn about them. Learning about our kids likes, will also show our kids we care about them. When I reeeaaalllyyy don't want anything to do with dirt and bugs, I think about my kids. I look into their eyes and see their excitement. I think about being a child and the sense of exploration that comes with growing up. I stop thinking about the laundry and all that I have to do and I go out with them. And then, all of a sudden, I see it from their perspective and everything changes. When all else fails, pretend. Our kids don't know how much I don't like dirt and bugs. They don't need to know. If I give them that information, I know it will squelch their sense of exploration. It's true, sometimes I fake it, and before I know it, I have made it. It is okay to not like everything our kids like, but it is important we support them so we don't hinder their learning and growth. Who knows, maybe our son will become a botanist, or geologist. That might not happen if I hinder his "likes" just because they aren't my favorite. What does your child like that you don't? How do you support your kids in their latest "passions"? Photo found via google images. Original source here. I giggled about the bugs. I am not so bad with bugs but I'm really bored by some of the games my kids like to play. I need to learn to take better interest. Thank you for the reminder. PS. I like the new look of the blog! My little ones regularly run into my office brandishing lizards. They know I won't touch them, but I will praise and photograph. Your brother reminds me of my little boy's serious conversation with me yesterday: "It's so strange--I wonder what goes on inside girls' heads? What's it like to be a girl?" FROGS! And all sorts of other bugs but mostly frogs. I love this post. I've been thinking a lot about this same concept as I've been working in my garden lately with my 3 year that "lubs wormies." The timing of this post was brilliant! I cannot tell you how knee deep I am in this season. Lots of prayer. Thankfully we are each fearfully and wonderfully made and for some reason, God chose me to be the mama of these three little kiddos, which means He thinks I am perfect for the job. I need His strength daily, especially where contrasting interested are concerned. Coincidentally, He created us to need Him, so I'd say it's all going according to His perfect plan.